Is a bite on ice cream bar or a sip of hot coffee sometimes a painful experience for you? Does brushing or flossing make you wince occasionally? If so, you may have sensitive teeth. When you have sensitive teeth, certain activities, such as brushing, flossing, eating and drinking, can cause sharp, temporary pain in your teeth. Sensitive teeth are typically the result of worn tooth enamel or exposed tooth roots. Sometimes, however, tooth discomfort is caused by other factors, such as a cavity, a cracked or chipped tooth, a recently placed filling, or a side effect of other dental procedures, such as teeth whitening. In healthy teeth, a layer of enamel protects the crowns of your teeth—the part above the gum line. Under the gum line a layer called cementum protects the tooth root. Underneath both the enamel and the cementum is dentin. Dentin is less dense than enamel and cementum and contains microscopic tubules (small hollow tubes or canals). When dentin loses its protective covering of enamel or cementum, these tubules allow heat and cold or acidic foods to reach the nerves and cells inside the tooth. Dentin may also be exposed when gums recede. Depending on the circumstances, there are several things you can do to address your teeth sensitivity problem, which you can either try at home or in dental office. Teeth sensitivity to temperature, touch, or acidic liquids can be a symptom of many dental problems that may require immediate treatment. If you’re concerned about sensitive teeth, start by visiting your dentist. He or she can identify or rule out any underlying causes of your tooth pain. During a dental exam, your Los Angeles dentist will evaluate your overall dental health and oral hygiene, including your risk of tooth decay, root decay, and gum or bone disease. Any reputable dentist in Los Angeles can evaluate your need for tooth restoration or tooth replacement as well as check your bite and jaw for problems that can lead to grinding. Your downtown Los Angeles dentist will also take dental X-rays or, if necessary, perform other diagnostic procedures. All these diagnostic steps will help your favorite Los Angeles dentist to determine if possible causes of your teeth sensitivity may include tooth decay (cavities), cracked or fractured teeth, worn fillings or crowns, worn tooth enamel, exposed tooth root, or gum disease. If this is the case, our highly qualified Los Angeles dentists will either treat your dental condition or will set up a follow-up appointment (or a series of appointments) for treatment as needed. Application of fluoride varnish can strengthen tooth enamel and reduce transmission of sensation in addition to helping to prevent tooth decay. A crown, filling, inlay, or bonding may be used to correct a flaw or decay that results in sensitivity. If gum tissue has been lost from the root, a surgical gum graft may protect the root and reduce sensitivity. Finally, if sensitivity is severe and persistent and cannot be treated by other means, your dentist may recommend root canal to eliminate the problem. Many brands of toothpaste on the market are designed to help people with sensitive teeth. 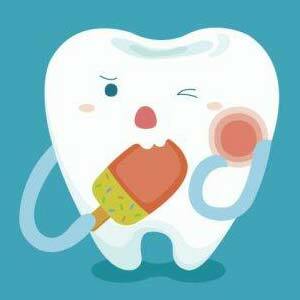 Some pastes contain an active ingredient called potassium nitrate, which helps to block the tiny tubules in the dentin. They don’t work for everybody, but experts agree it’s usually the best place to start. Lots of times people use toothpaste for sensitive teeth just for a little while and then they stop. But you need to continue to use it over time to get consistent results. You can also ask your favorite Los Angeles dentist for prescription toothpaste when visiting our downtown dental office. We will be happy to either sell you a tube of prescription-strength toothpaste if available in stock or to write you a prescription. Prescription for sensitive teeth toothpaste can be filled by any pharmacy and may be partially covered by your prescription plan. If you’re not using a soft toothbrush, if you’re scrubbing your teeth vigorously, or if you’re not brushing for a full two minutes, then you’re not doing any favors for your sensitive teeth. Hard brushing can actually wear away enamel, increasing the sensitivity in your teeth. If you have any recession of your gums or bone loss-and your tooth root is exposed as a result-then you’re also scrubbing at cementum. Cementum is meant to protect the root of the tooth, but wears away even faster than enamel. Changing your brushing habits is hard, but it will definitely pay off. Exposure to red wine, soda, fruit juices and acidic foods such as oranges and pickles-can put your enamel under constant attack. Limit these foods and drinks and make sure to brush your teeth about 20 minutes after eating. (Brushing earlier than that may hurt your enamel even further.) Even if your teeth aren’t yet sensitive, it’s a good idea to be cautious about consuming acidic foods and drinks as enamel loss is irreversible. If you grind your teeth when feeling stressed or in your sleep, you may be wearing away enamel and adding to the sensitivity problem. You may not even realize you’re grinding. Often people only do it while they’re sleeping, but unexplained jaw pain or headaches could be a clue. If you do grind your teeth, ask your favorite Los Angeles dentist for a custom mouth guard to wear at night. If you notice yourself clenching during the day, remind yourself to relax your jaw with your teeth slightly apart. As your favorite Los Angeles dentist, we urge you visit our centrally located dental office regularly for semi-annual dental check-ups and let us know immediately if you experience unusually sensitive teeth, which may be a symptom of a more serious dental issue. While using sensitive teeth toothpaste and improving brushing techniques are a good start, only a dental exam by your downtown Los Angeles dentist will help to ensure that you do not need any additional dental procedures. For more information about treatment of sensitive teeth or to schedule your Los Angeles dentist appointment please call us at 213-486-0006 or make your appointment online.